> 3.6 Rating, Out of:50/5 Stars. Navsari lies to the south of Surat in Gujarat and is also said to be Surats twin city. Located near the Purna River, the city lies at a height of 9 metres above sea level. According to historic records, the Parsis were the first settlers in the city. They gave the city its original name, Navu Sari. Sari is a city in erstwhile Persia and Navu Sari literally translates to New Sari. During the British rule, its name got contorted to its present name. The city is known for its two lakes, namely Dudhiya Talav and the Sharbatiya Talav. Like the rest of the state of Gujarat, Navsari too experiences extreme climate. The maximum temperature in the region hovers around 40° Celsius during summers while the minimum temperature during the winters can reach around 10° Celsius. Navsari is also the birth place of Jamsetji Tata and Dadabhai Navroji. Jamsetji Tata is known as the father of the Indian industry, while Dadabhai Navroji was an important figure in Indias struggle for independence. The Atash Behram, situated close to the Tarota Bazar in Navsari and one of the seven Atash Behrams in the world, is visited by numerous Parsi Zoroastrians. Other places of tourist interest in Navsari include the Ashapuri Temple, the J.N. Tata Memorial Hall, the temple of Ravariya Bapa and the Shri Swaminarayan Mandir. The coastline close to the city holds an important place in the modern history of India. The Dandi March, the first major revolt against the British rule, took place in the village of Dandi which is situated in the coastline. Navsari has a railway station, which lies in one of the busiest railway corridors of India, the Mumbai-Delhi corridor. The nearest airport to the place is at Surat, which is located 30 km away. It is also well connected by roads via NH-8 highway which runs through the place. Navsari Tourism - Get all information on Navsari tourist places and sightseeing tours. Our website helps you plan your next tour and gives you great ideas on what to do, where to eat, where to stay and when to go there. We give the best information from the web to give you precise, meaningful and useful travel guide for leading places to visit in India and from across the world. Our travel information on NAVSARI tourist places, tourist attractions, major sightseeing, the best time to visit, the top places to visit in Navsari, the must-see things to see and do, maps, restaurants, hotels, nearby tourist destinations, local public information and more. 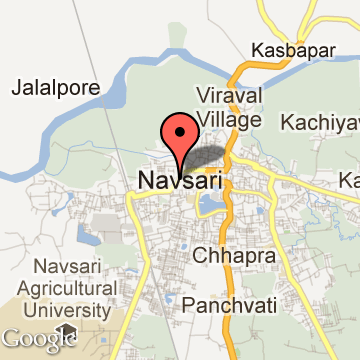 To start with check out information on how to reach Navsari.